London, Colnaghi & Co., 1982. Clovis Whitefield, Discoveries from the Cinquecento, London, Colnaghi & Co., June 17 to August 7, 1982, 64, no. 31, 32, Color Pl., as Rosso. Possibly the picture mentioned by Ciardi, 1994, 20, as at Piero Corsini’s in New York in 1990. Costamagna, 1994, 94, n. 16, as derived from the painting in the Corsini Gallery in Rome and not very probable as by Rosso. I know this painting from the large color plate in Whitefield’s catalogue, and from the illustration in Rubin’s review. Rubin pointed out that the composition is identical to that of a painting in the Galleria Colonna in Rome (her Fig. 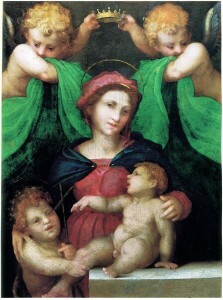 72), attributed to Andrea del Sarto, although earlier given to Domenico Puligo.1 It is also related, as Rubin stated, to a painting sold in New York in 1923, which was recognized by Shearman as related to a lost Madonna and Child with Saint John under a Baldacchino by Sarto of around 1512.2 It should be noted that none of these pictures is actually attributable to Sarto himself. The painting in the Galleria Colonna appears derivative itself and not representative of an early work by Sarto as Rubin would like it to be. Its former attribution to Puligo deserves some attention, even if it is not right on the mark. 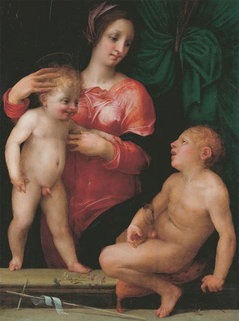 The Colnaghi painting moves even farther away from Sarto, not, however, in interpreting the Colonna image in a manner that would indicate Rosso, but in a style of academic correctness. This is especially noticeable in the spacing of the figures, creating a composition that is far more spread out, quite unlike Rosso. Furthermore, I see nothing in the details of the painting – in the drawing of the heads and limbs or in the definition of the drapery – that suggests Rosso anywhere. The painting seems to me to have been done in the 1530s or 1540s, and bears a certain stylistic relation to the Madonna and Child with the Young Saint John the Baptist in Frankfurt that has also been attributed, wrongly, to Rosso (Fig.RP.10a). 1 Safarik, Eduard A., Catalogo sommario della Galleria Colonna in Roma, Busto Arsizio, 1981, 25-27, no. 8, with Fig. 2 The New York picture: Shearman, 1965, I, Pl. 34a, II, 289, no. 2, as by an assistant of Sarto of a composition by him of around 1512-1514; the Baldacchino Madonna. Shearman, 1965, I, Pl. 30c, II, 210, no. 24.